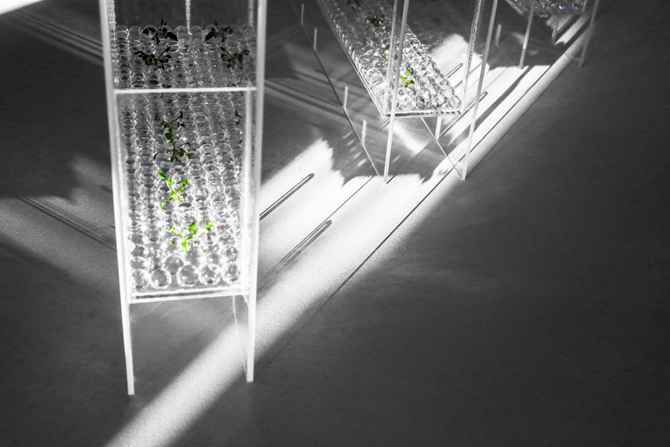 Zenovia Toloudi / Studio Z, Photodotes II: Light Garden. Boston, MA, 2012. Installation as part of Garden Lab exhibition (2012), Brant Gallery, Massachusetts College of Art and Design. 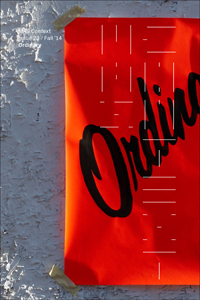 Curated by Evelyn Rydz, and Jonathan Santos. © Photograph by Dominic Tschoepe. The rapid urbanization and uncontrolled growth over the past century had caused the colonization of cities over nature. This resulted in the recent reclaim of the green to the built environment. The return has been manifested through big (scale) exaggerations: in the outskirts, wherever land is abundant, architects merged architecture with landscape, camouflaged it with green ecological materials, or mimicked bio-natural processes and systems. In the urban setting, given the opportunity, they retroactively greened roofs, walls, or any imaginable architectural surface. What is the antipode to this greening camouflage? Can architecture re-imagine its natural-tectonic configurations where neither nature nor structure “erase,” from after the facts, each other? In the meantime, in the techno-scientific (figs. 2-3) and art realm the re-colonization of nature comes frequently with highly controlled environments, of very small scale. State-ofthe-art research in fabrication and biotechnology have empowered disciplines and simple users to experiment endlessly by manipulating objects and environments to desired conditions. Bio-artists such as Suzanne Anker (fig. 4), engineers such as David A. Edwards, and designers such as Sean Lally (fig. 5) have been testing innovative ideas with scientific standards in laboratory conditions. These works are presented and admired as art pieces or precious jewelry inspired by laboratory aesthetics. Many of the experiments form contained, objectified nature. Figures 2-3. 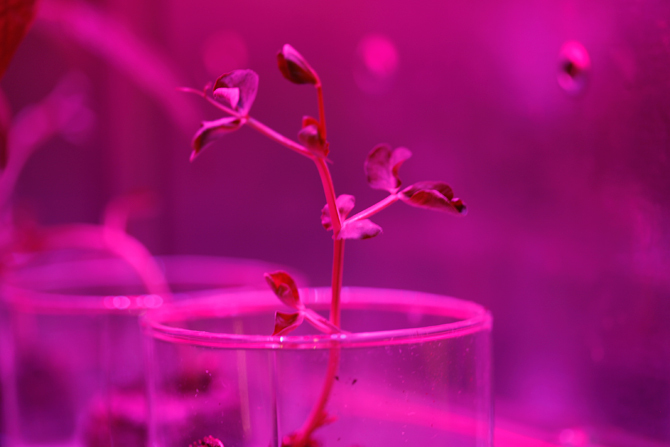 Kristophe Diaz, Arabidopsis Thaliana Plants Used as Model System in Science, Plant Lab, University of Massachusetts Boston, MA. © Photograph by Zenovia Toloudi. Figure 4. Suzanne Anker, Astroculture (Shelf Life) (01), 2009. Inkjet print on Hahnemuhle paper, 24 x 36 in. Figure 5. Sean Lally / WEATHERS, Amplification, Los Angeles, California, US, 2006–2007. Installation as part of the Gen(h)ome Project (2006). Curated by Open Source Architecture, Kimberli Meyer, and Peter Noever; The MAK Center of Art and Architecture. © Photograph by Joshua White. The objectified nature forms extend, beyond the art laboratories, in the architectural world. During the making of the Photodotes installations the idea was to use objectified nature as part of an architecture that promotes natural light in dark (window-less) spaces. The Photodotes series investigate “living” and edible structures, the immaterial as building element, light as energy, and the use of technology in architecture, and gardens. In Photodotes, the natural and immaterial elements are integrated in the structure from its genesis; in the case of Photodotes II, and III, plants, fiber optics, water, light, and plastic transparent containers were all composed together to form one whole. In Photodotes II: Light Garden, the pots were sculpted with different criteria or manifestos: to allow growth towards different directions, to follow the form and the intentions of the plant, to help the plant co-exist with other plants, to “force” symmetrical development, to create vertical planting, and to change the functions (fig. 6). They were collectively assembled to co-construct the “circular” Photodotes Garden. The collaborative character of the installation registered individual craftsmanship and signature expression for the creator of each pot (fig. 7). Figure 6-7. 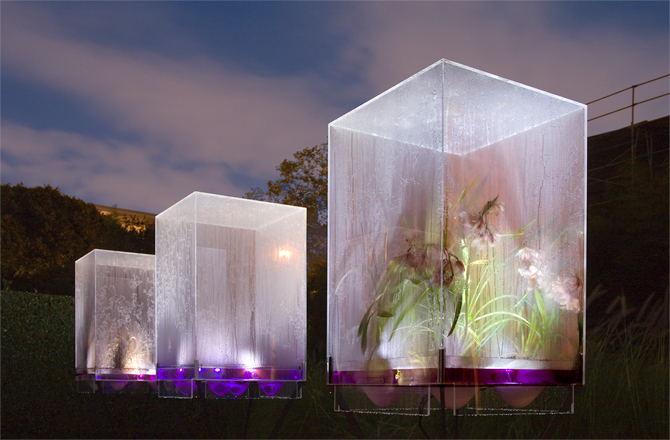 Zenovia Toloudi / Studio Z, Photodotes II: Light Garden. Boston, MA, 2012. 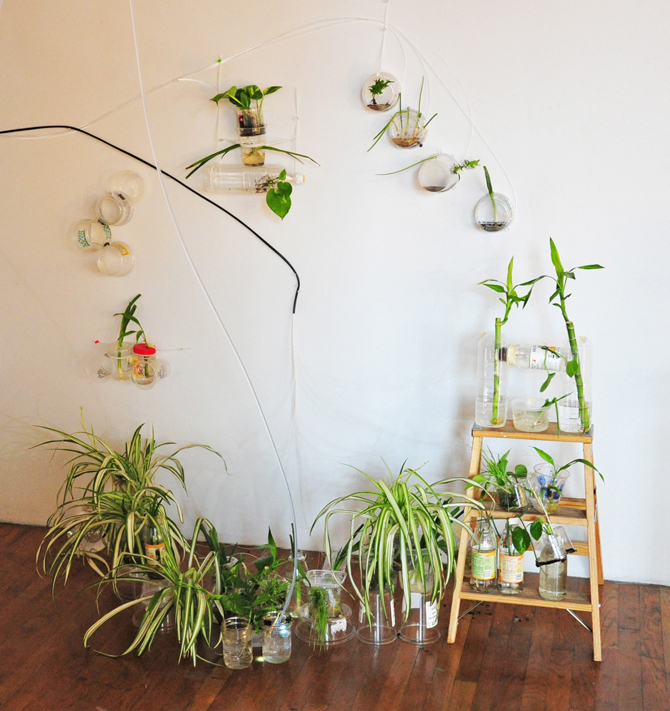 Installation as part of Garden Lab exhibition (2012), Brant Gallery, Massachusetts College of Art and Design. Curated by Evelyn Rydz, and Jonathan Santos. © Photograph by Dominic Tschoepe. Coincidentally, such objectified nature within pots, appears as well integrated in the white, compact, contemporary Japanese architecture. 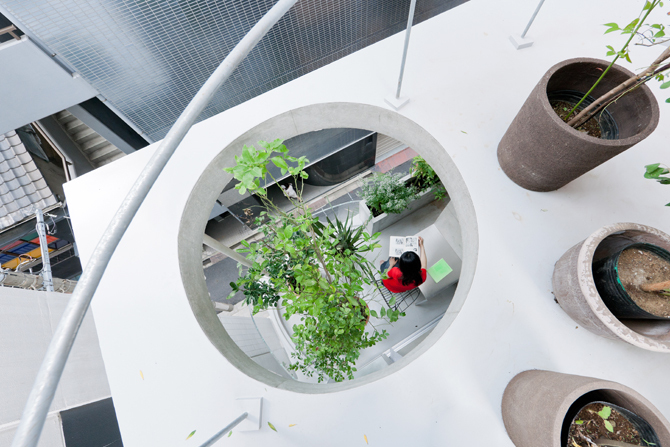 It is not uncommon to discover the incorporation of potted plants both in the recent publications and exhibitions of the most admired, emergent, Japanese architects, as well as in the streets of Tokyo. The integration of potted plants, and use of objectified nature form a series of small gardens, spaces that can be characterized as Lilli-pot, a composite adjective deriving from the words Lilliput and pot. The Lilli-pot Spaces are constituted by multiple small, precious objects, and objectified, compartmentalized nature, that offer a recursive oscillation between the literal and the minimal, tradition and contemporaneity, singularity and multiplicity, curation and randomness. Lilli-pot Spaces like Photodotes III: Plug-n-Plant belong to a group of projects, found in galleries, museums, laboratories, and the streets establishing a recognizable architectural style of objectified, compartmentalized nature coming in forms and positions of high surgical precision (fig. 8-9). Figure 8-9. 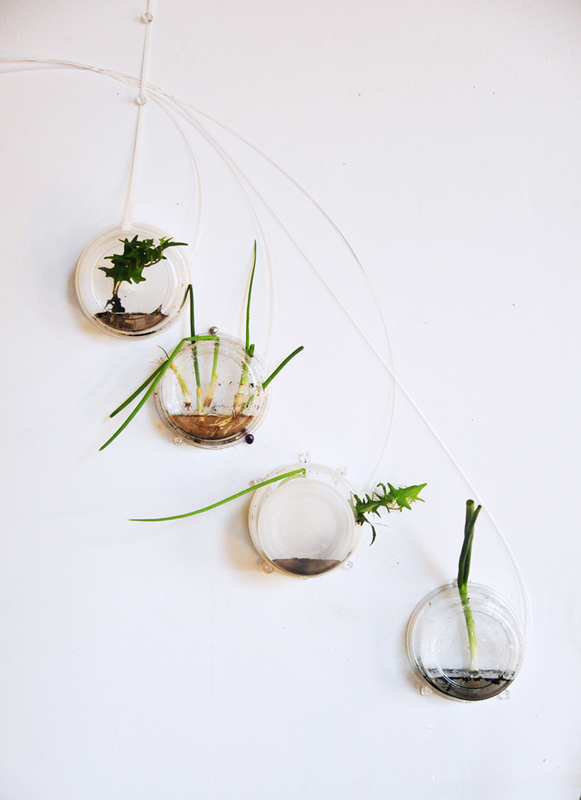 Zenovia Toloudi / Studio Z, Photodotes III: Plug-n-Plant. Cambridge, MA, 2013. Installation as part of solo exhibition at Industry Lab. © Photograph by Kristophe Diaz. How have these common potted plants with their long practical and decorative history become curated objects in streets, patios, and buildings? To analyze their function in space, Lilli-pot Spaces, can be examined through their Tokyoite and Japanese occurrence, as well as through the lens of the vernacular, theatrical, Lilliputian, illusionary, curatorial, and social. Figure 10. Junya Ishigami, Kanagawa Institute of Technology workshop (KAIT-Kobo), Atsugi, Kanagawa Prefecture, Greater Tokyo area, Japan, 2008. © Photograph by Iwan Baan. In March 2012, artist and MIT Professor (between 1990-2014) Antoni Muntadas led a research trip to Tokyo investigating Japanese public space. 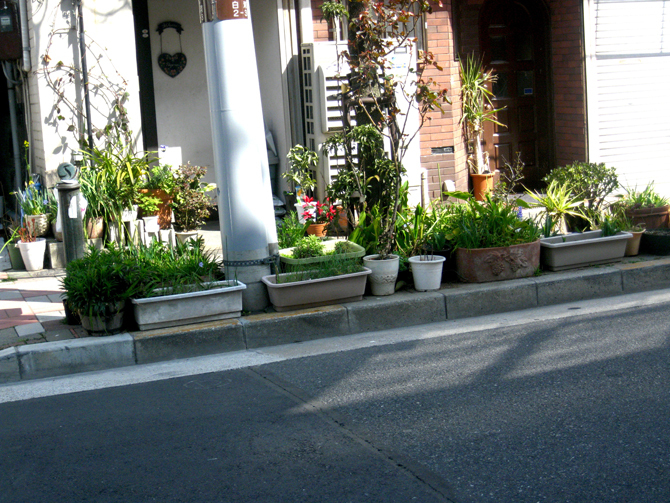 During the trip numerous Lilli-pot Spaces were found in the streets of Tokyo (fig. 11) in areas characterized by Jorge Almazán as an “urban village.”  The plants bring to mind images and memories from rural, vernacular, and traditional spaces often found in villages and the periphery. 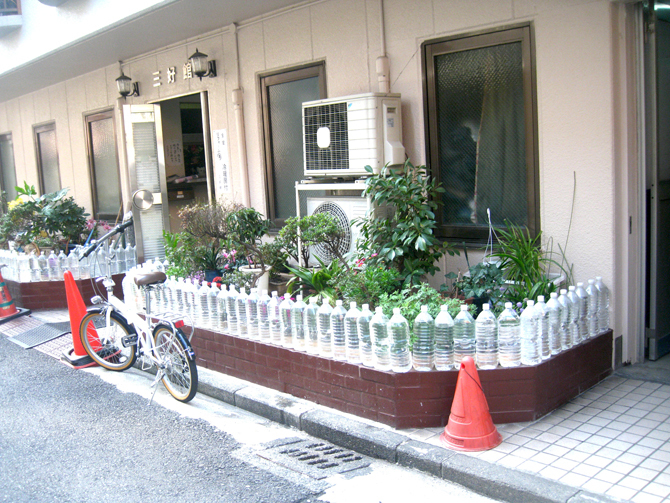 At the same time the interplay of potted plants contrasts the futuristic image of Tokyo, with a more human scale. The small gardens of potted plants, as well as other similar occurrences, constitute what Almazán considers as “shared space.” In this, there is no distinction between walkway and road. Instead of separating the traffic, there is a constant human negotiation between drivers and pedestrians. These micro-environments extend the coziness and care usually found in private spaces to the public streets by creating a private-public hybrid, a kind of oasis for busy citizens and wondering tourists. The potted plants, beyond their organic nature, become symbols of the empowered individual who now appropriates their surroundings through them. Figure 11. Lilli-pot Space in Tokyo, Japan. March 2012. © Photograph by Zenovia Toloudi. When Toyo Ito invited proposals for the post-tsunami architecture during the 13th Venice Architecture Biennale  the architects experimented extensively with the nature−architecture relationship. Many of the models presented in the exhibition used logs, branches, and other natural elements in vernacular configurations that now seem to form the new canon. For Ito the return to the traditional offers a more social and humanitarian approach to architecture. In his lecture at Harvard Graduate School of Design in 2012, Ito attributed this influence to his teacher Kiyonori Kikutake, who had been an independent voice among the Metabolists. Kikutake’s work had strong influences from Japanese traditional architecture (including its small scale). Ito presented Kiyonori Kikutake’s Sky House, in which “the tools and furniture, and other beautiful pieces,” were all inspired by the farm culture. Another element from the rural house (and culture) that had been very influential for Kikutake is that of the column/pillar, and its function to define space around it. Ito used the pillar as a dominant element for the Home-for-All project, as well as for the design (and content) of the Japanese pavilion. The vernacular bound through the small parts and objects interrogates the nature-structure relationship, while presenting marks of collective expression that trace the human hand and the individual taste. The recognition and embedment of these elements in the design synthesis, allows the architects (according to Ito) to see things from inside, towards a more social architecture. In Lilli-pot Spaces, the vernacular is found also through the appearance of nature, the use of small objects (the pots), and human gesture. These elements contribute to the personalization of the “public” and shared space that occurs around them. Ordinary potted plants have existed in many cultures and contexts since the ancient times for a variety of reasons, like transferring plants and seeds, offering protection from the weather, or being personal objects for tombs. It was around the eighteenth century that they were used for decorative purposes. What seems to be more of a late phenomenon is the very recent, theatrical presence. Both in the case of contemporary architects, as well as in the Tokyoite informal urbanism, nature (intentionally or not) is incorporated in the architecture, objectified. In the name of photography, the potted plants are positioned as part of a stage to create a literal (even picturesque) image that could have easily been part of a museum or gallery. Whether found in the drawing, photograph, or real experience, the objectified nature of Lilli-pot Spaces is staged for a viewer. This objectification is familiar in the art realm. Michael Fried, in Art and Objecthood, explains how minimal art, through the experience of literalist art, becomes an object in a situation (that includes the beholder). For Fried, this becomes a new genre of theatre, which he considers as the negation of art. This literalist sensibility, and the literalist espousal of the “objecthood” in minimal art address theatricality and temporality. The literalist has a preoccupation with time and duration of the experience, which becomes theatrical. This takes relationships out of work and makes them a function of space, light, and viewer’s field of vision. It constructs the stage presence. The disconnection of the outdoors, along with the establishment of city living and working mainly indoors request this staged setting of the “natural.” In Lilli-pot Spaces, the pots and plants, with their temporal “nature” become the protagonists of the space by marking situations and events that co-occur along with people’s life. Objects (having a life of their own) and the construction of worlds constitute an inherit desire in small children. Miniature models and Lilliput worlds, like Legolands and dollhouses, act as communicative and illusionary mechanisms. Donald Winnicott, in his Reality and Play, examines thoroughly this function of transferring from illusion to reality. For Winnicott, teddy bears, dolls, and toys are the transitional objects that transfer humans from the breast and mother-dependence to the first relationship and maturity (forcing them to a reality test). By offering the illusionary experience, they smoothen the transition from inability to ability to mature. Toys and puppets are used by parents to communicate messages to their children. For example, a small kid is more easily convinced to eat their food when getting orders from a small puppet or any favorite object, less associated with rules and disciplines, and more linked to joy and pleasure. Similarly to toys, the small plants of Lilli-pot Spaces also become transitional objects between the (now lost) wiring with nature and the contemporary-constructed city and urbanity. Beyond the natural and organic element in them, Lilli-pot Spaces are agents to offer to contemporary busy citizens and home users a connection to creativity of the anonymous, carefree, maker of the past. Offering a getaway from reality, design participation, and collectivity, Lilli-pot Spaces conceptualize humans’ need for more desired environments to live in (fig. 12). Figure 12. 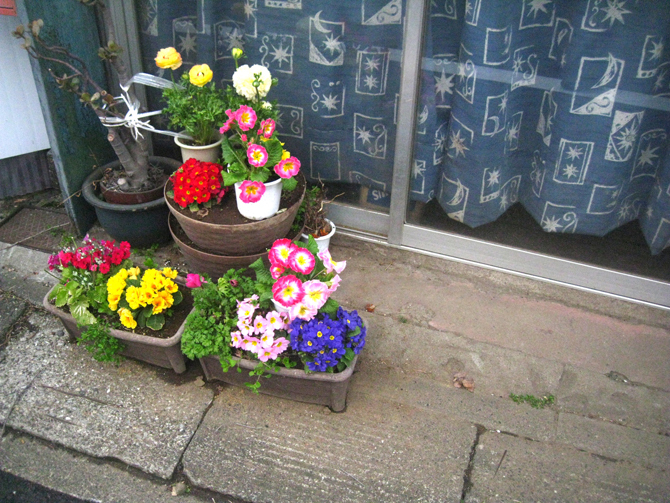 Lilli-pot Space in Tokyo, Japan. March 2012. © Photograph by Zenovia Toloudi. In Lilli-pot Spaces, as well as in vernacular manifestations, the presence of the anonymous creator (and their hand) is suggested by small parts, small sizes, and small gestures: the small (fig. 13). Japan has been always associated with the small and smallness in cultural and architectural expressions. Avant-garde Japanese architects have been embracing the small through projects, theories, exhibitions, and publications. Through its dimensionality and bodily engagement, the small is comfortable. With small it is possible to understand it, possess it, and observe its fullness. It inspires fantasy and creativity. Like in the case of miniature model makers, the small is associated with a passion for precision: a fulfillment of the detailed controlled activity that dominates many individuals. Such desire for control and detail with surgeon accuracy and orchestration is common among architects that enjoy creating and shaping (small) worlds. Figure 13. 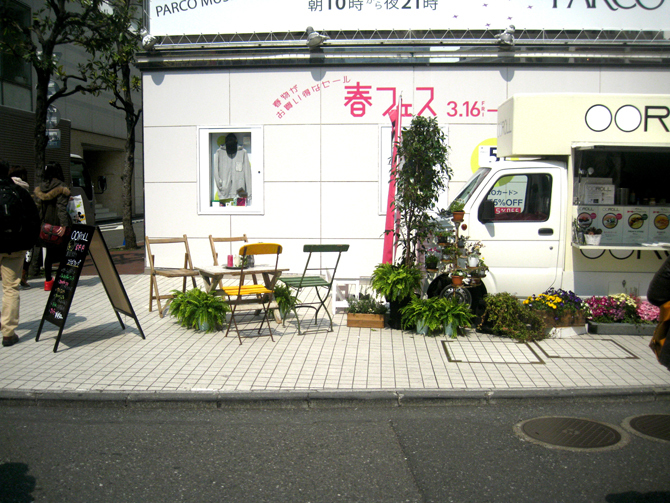 Lilli-pot Space in Tokyo, Japan. March 2012. © Photograph by Zenovia Toloudi. Small, as an element, relates not only to size but quantity. Small things coming in crowds can propose an antidote to the singular big action or the one unified mass. Small, being accompanied by the repetitive, exists in many examples of Japanese architecture: the multiple windows of Zollverein School (by SANAA), the repetitive volume-rooms in the Moriyama House (by Ryue Nishizawa), and the many object-galleries of the 21st Century Museum of Contemporary Art, Kanazawa (by SANAA). The particularity of each of these small elements is reinforced by the layout of the multiple parts. What appears random or amateurish in the arrangement of those parts is the result of the aforementioned surgical precision. This controlled “randomness,” distinct shapes, and particular positions of these plants define the composition and the character of the space, that moves beyond the informal, vernacular compositions, towards the aforementioned staged presence (fig. 14). Potted plants are curated objects that form a recognizable style to be repeated in more and more architectures. Combining many Lilliputian objects into a randomly precise whole establishes a situation where multiple relationships occur while allowing for both autonomy and connectivity among the parts to co-exist. The multiple small parts, instead of the one mass, can be rearranged to offer flexibility and functionality. Figure 14. Lilli-pot Space in Tokyo, Japan. March 2012. © Photograph by Zenovia Toloudi. This multiplicity defines the social space and architecture. And it is based on that individual small element that is repeated. In Things that Talk, Antoine Picon examined the role of such an element, that of the freestanding column in the eighteenth-century religious architecture. For Picon, this architectonic device, acting as (cultural) mixture of different things, offers heterogeneity and enables social imagination. In Lilli-pot Spaces, the construction of social imagination takes place through the aesthetization, multiplicity, and theatricality of these ordinary objects, in this case plants. Being small and many, instead of one big, express the multiple views and truths that exist in a crowd. The multiplicity of the small elements in various compositions reproduces in a way the structural organizations that appear in dense metropolises such as Tokyo. The theatrical and anthropomorphic elements, echoed in these compositions, resemble to the crowds of citizens that exist in dense environments. Like in polymorphic societies, these small elements appear as a collection of unique ones. This assemblage of discrete objects becomes the mechanism to evoke the collectiveness. Being small and affordable, they are available to all. They constitute a more human model of living. They inspire negotiation and mutual respect among the various users of the shared small space. User’s ordinary needs that are often neglected by the architects reveal themselves through user’s aftermath actions, such as plant decorations. However, SANAA, with their detailed drawings and models, including the personal or mobile objects of the users and other remnants of human presence, manifest an architecture that is closer to the users. It understands and engages their needs from its early formation. The objectified natural elements become a choreographed operation that offers visibility and clarity to the crowd. These objects and compartments, elements of soft space are more graspable, and identifiable enough, for the audience to understand, accept, and enjoy. The things that attract the attention are not always the “beautiful” ones, but the ones that link to memories and former experiences. These pots, as familiar and ordinary symbols of the village, become agents to connect humans to their lost nature. 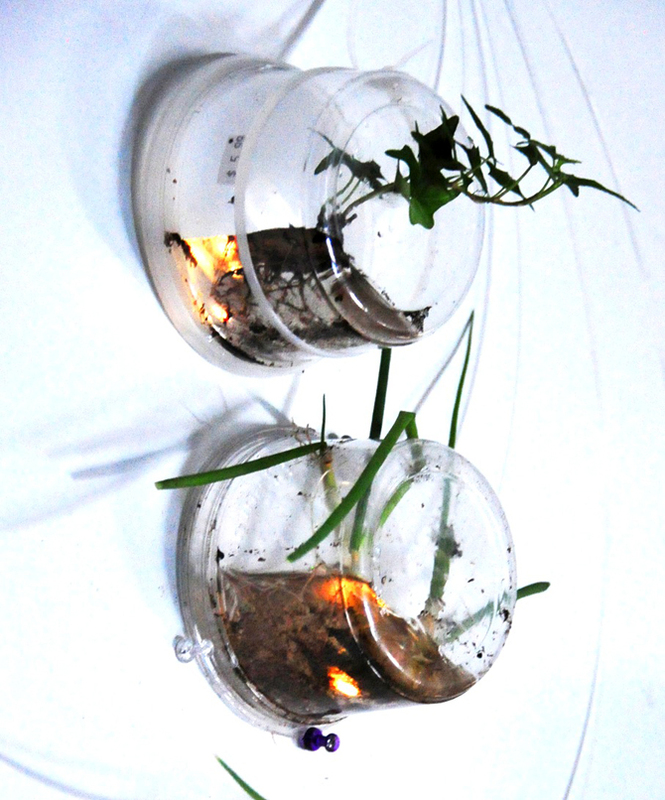 In response to the initial question, natural-tectonic configurations such as Lilli-pot Spaces do not erase or camouflage the two antagonists (nature and structure), but they exist in synergic mode: the small potted plants celebrate the contemporary architecture, and the architecture itself welcomes in its structures, forms, and materialities the existence of these plants and small objects (fig. 15). They are not dense, they do not look like jungle; they are a collection of pots, each one having a specific position, presenting simplicity, low-cost materials, the decay of the living, and mostly the underestimated, ordinary things. Japanese architecture, often praised to glorify the social, offers a paradigm of how the ordinary, small little things have power to affect the spectacular big. It also experiments by valuing and incorporating the needs and desires of the user. Such architecture engages the natural, while satisfying the public imagination and pleasure. Figure 15. Ryue Nishizawa, House & Garden, Tokyo, Japan, 2011. © Photograph by Iwan Baan. The small Lilli-pot Spaces are social devices that link architecture and the city through the vernacular; engage interaction that brings human scale; become transitional objects to communicate meanings and awaken memories; perform as aestheticized art(ifacts) that address theatricality and temporality; and eventually offer a kind of design that includes (beyond the lost nature or the organic matter) the expression of the anonymous, ordinary user together with that of the extra-ordinary designer to inspire collectivity and co-habitation. 1. Photodotes, from the Greek word φωτοδότες meaning “light donors.” The etymology of φωτοδότης is linked to the Greek words φώτο (light) and δότης (donor). 2. SANAA perhaps started to embed these objects in their designs, during (or after) the Plum House. Jorge Almazán, discussion with author in Tokyo, Japan, March 2012. 3. 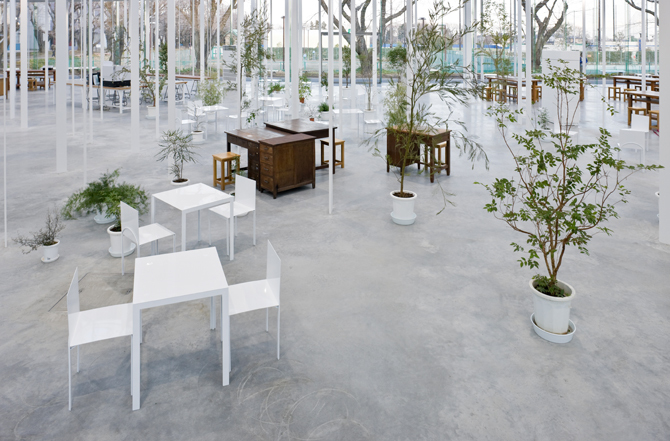 The “Hanahana Flower Stand,” designed by Kazuyo Sejima, is part of the group of objects/plants, merging what may be considered as artificial and natural plants. 4. SANAA’s drawings, models, and photographs of built works all embed elements that personalize the space. These range from plants, flip-flops, carpets, etc. One could say that all these objects contribute to a potential fetishism. 5. The drawings (or models) contain the lines (or figures) of the small, portable plants together with the lines (or volumes/surfaces) of the more stable elements, such as walls, floors, and pavements. 6. “ Urban village” is one of the two urban intensities that appear in Tokyo broader metropolitan area. Jorge Almazán (presentation to a group of students from MIT, Tokyo, Japan, March 2012). 7. The 13th International Architecture Exhibition “ Common Ground,” directed by David Chipperfield, August 29, 2012 to November 25, 2012. 8. Even the exhibition is designed to include pieces of nature, like the tree logs. Many of the exhibits are presented in a very small scale. 9. Michael Fried, “Art and Objecthood,” Artforum (Summer 1967), reprinted in Gregory Battcock, Minimal Art: A Critical Anthology (New York: E.P. Dutton, 1968), 116-147. 11. The theatricality of Morris’ notion of the “ non-personal or public mode” is obvious: The largeness of the piece, the bigger the distance from the beholder, and therefore their isolation. The hidden naturalism, is in fact anthromorphism, and the hidden [-ness] anthromorphism is theatrical. 12. Elizabeth Grosz, “The Thing,” in The Object Reader, eds. Candlin, Fiona, and Raiford Guins (London: Routledge, 2009). 13. Grosz refers to Bergson. 16. “ We live and fabricate things.” Ibid., 136. 17. Donald W. Winnicott and Robert Rodman, Playing and Reality (London: Routledge, 2010). 18. James Roy King, “Exploring the Lilliput,” in Remaking the World: Modeling in Human Experience (Urbana: University of Illinois Press, 1996), 21. 19. Antoine Picon, “The Freestanding Column in the 18th Century Religious Architecture,” in Things That Talk: Object Lessons from Art and Science, ed. Lorraine Daston (New York: Zone Books, 2004). 20. To explain this, Picon borrows from Kornilios Kastoriadis the analogy of a chimera. 21. In an effort to understand the fascination of the freestanding column, Picon describes that architecture as a system whose elements are clearly distinguished from one another. 22. Maria Toloudi, discussion with the author, October 21, 2012. The author would like to thank the following individuals: George Toloudis, Panagiotis Stamboulidis, Kristophe Diaz, and Dimitris Papanikolaou for their contribution to Photodotes series installations; Yamilah Kenny, Christian Keebler Restrepo, Dominic Tschoepe, and Amir Banihashem for their assistance during Photodotes II workshop; Lydia See, Brianna Dawes, Juliet Demasi, Colin Cardinal, Anika Catterfield, Georgia Kennedy, Julie Chen, and Hayden Lemire for their participation during Photodotes II workshop; and Nasser Rabbat and Aliki Economides for their comments and insights on Lilli-pot Spaces essay. Zenovia Toloudi is architect, artist, and Assistant Professor at Studio Art, Dartmouth College. She has received a Doctor of Design degree from Harvard GSD, a Master of Architecture from Illinois Institute of Technology (as a Fulbright Fellow), and a Diploma in Architectural Engineering from Aristotle University of Thessaloniki. 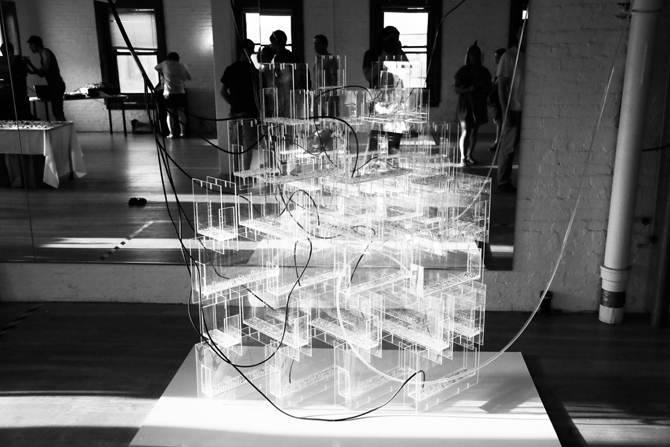 In 2000, Zenovia founded Studio Z, a research and art-design practice that centers on architecture, ephemeral and adaptive structures, and experiential installations. She has taught at Harvard, MIT, IIT, WIT, BAC, Aristotle University, and Hellenic American Educational Foundation.